It used to be unusual to find a book centered on older characters but in recent years there seem to be more and more books that acknowledge that neither aging out of your twenties nor living past the child rearing years means that life is over. In fact, the books coming out now show that not only are people still living interesting lives, they are grabbing hold of that life, still growing and changing no matter what their physical age. 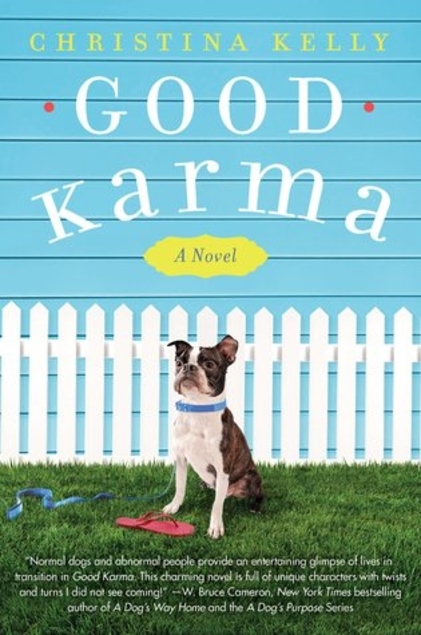 Christina Kelly's novel, Good Karma, with a cast of kooky characters and major life disruptions shows just this. Catherine and her husband Ralph have retired, moving from New Jersey to Georgia. Their marriage had already grown distant but retirement really highlights just how little they connect anymore, and Catherine at least is hoping this move to a gated community called Seven Oaks outside of Savannah* will bring them closer together again. But it soon becomes clear that they are looking for different things out of retirement. Catherine wants companionship while Ralph might want the brassily alluring real estate agent they're working with to buy their home. When Catherine takes her Boston Terrier Karma to the dog park, she meets Fred and his lovely Great Dane named Sequoia. Fred is a widower, having lost his beloved wife Lissa to cancer less than a year previously and he's been struggling with grief and depression ever since. These two lonely people start to build a friendship with the help of some truly nutty characters, their dogs, and Lissa's ghost. This is a generally sweet book and Catherine and Fred are sympathetic characters. Most of the rest of the characters are more than a little crazy. There's Ida Blue, the pet psychic who discovers that she actually can see the dead thanks to Lissa's ghost. There's the pushy and rather unpleasant realtor who only acquired a dog because she thought it made her look good. There's Amity, a young woman going through a divorce who breaks into people's homes (she calls it "creeping"), not to steal anything but to imagine herself in a different life. There's Ralph, a man clearly having a late mid-life crisis who is every cliche in the books. And there's even a named alligator who lives in the lagoon behind the realty building. The main plot line is obviously concerned with Catherine and Fred and what their future looks like, as friends or as more, but there are a multitude of secondary plot lines which aren't as well developed as they could be. The climax right before the end is a bit Three Stooges slapstick but most of the comedy in this is far less obvious and over the top. In general this is a sweet novel, maybe a little too sweet, about starting over, growing out of a marriage, loss, and love and those who don't mind a little paranormal mixed in with their sugar and looking for older protagonists will be happy to "creep" into these characters' lives for a time. *Anyone familiar with Savannah will recognize Seven Oaks as The Landings on Skidaway and there seems to be no good reason to have changed the name of the community.